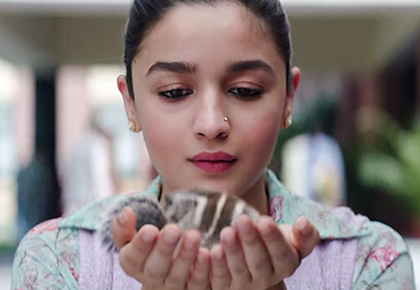 Rediff.com » Movies » Raazi: Will it be Alia's best performance? Jahnavi Patel feels it's an Alia Bhatt show all the way. The trailer of Meghna Gulzar's Raazi is out, and it's absolutely gripping at 2 minutes, 21 seconds. Based on Harinder Sikka's novel Calling Sehmat, the film highlights the India-Pakistan tension in 1971. The film revolves around Sehmat, a Kashmiri girl, played by Alia Bhatt, who is married to a Pakistani soldier, Vicky Kaushal. Alia's father (Rajit Kapoor) wants his daughter to be India's 'eyes and ears' in Pakistan. A daughter, a spy and a wife are the three roles assigned to Alia, and she portrays them with conviction. She's mysterious, vulnerable and tough in equal measure. From the innocent girl at the start, to training to be a spy to aiming a gun at her husband in the end, we get to see different shades of her. Does she fall in love towards the end? The emotional turmoil we see leaves us asking for more. We have seen Alia in diverse roles, and she's been good in every one of them. We don't get to see much of Vicky in the trailer, but we are sure there's a surprise in store for us. Raazi releases on May 11.